Popart Chalk Marker 4.5mm box 10 individual colours. Popart Chalk markers are a high opacity chalk marker that is perfect for any non porous surface. The marker provides a solid layer of liquid chalk that when dry is even able to be layered. The marker can be used used on windows, mirrors, ..
Popart Chalk Marker 4.5mmPopart Chalk markers are a high opacity chalk marker that is perfect for any non porous surface. The marker provides a solid layer of liquid chalk that when dry is even able to be layered. The marker can be used used on windows, mirrors, metal and white boards. 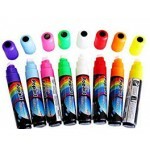 The Popart m..
Popart Chalk Marker 15mm box 5 individual colours. Popart Chalk markers are a high opacity chalk marker that is perfect for any non pourous surface. The marker provides a solid layer of liquid chalk that when dry is even able to be layered. 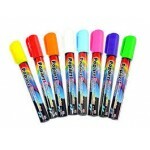 The marker can be used used on windows, mirrors, metal and ..
Popart Chalk Marker 15mm ea. Popart Chalk markers are a high opacity chalk marker that is perfect for any non pourous surface. The marker provides a solid layer of liquid chalk that when dry is even able to be layered. The marker can be used used on windows, mirrors, metal and white boards. The Popa..